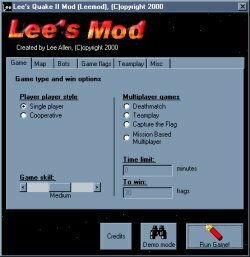 Lee's MOD is an Quake 2 mod I wrote many years ago where its main function was to supply a bot for deathmatch. When developing the project, I got the bot able to play more types of games including Team-deathmatch (by male/female/cyborg) and Capture the flag. After a bit of work with the bots, I added in some more extra improvements to the Quake 2 engine. Theses included an Darkmatch option (where the level is dark and you use torches to see around, and you can see other torches), Deathcam (a cam which follows your attacker), Acceleration and Deceleration of objects for smoother gameplay (ie. 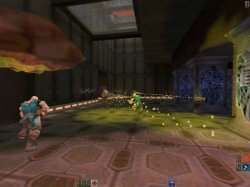 fans speed up and down rather than instant movement), monsters bleed and slowly heal, a new weapon - proximity grenade and fixed the randomizer (has Quake 2 did some similar things every time a map was started). 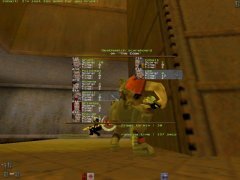 By the end of the project I started work on MBM (Mission Based Multi player) this was like assault mode in Unreal Tournament but for Quake 2. I also did an option where you could turn all the weapons on a level to a certain one (rocket/bfg etc. arena) or completely random weapons on level load or every spawn. The project was never really 100% completed, but is fairly complete. 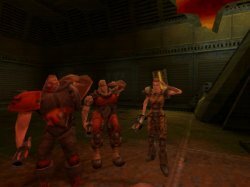 The mod was hosted on PlanetQuake but is no longer. Intelligent Bots (coop, deathmatch, teamplay and ctf)!!! Make sure you have Quake 2 installed with the last patch installed for maximum compatibility, then download the zip and unzip the files to your Quake2 folder. The files should be located in Quake2\lee folder. This page loaded in 0.00174 seconds. If you like to help, please consider making donation.